Use the Records Management Program Analysis Document to assess business processes and describe how the organization's records are governed. The report includes the evaluation of all records related policy and procedures and regulatory requirements. The analysis establishes the framework for changes to an existing Records Management Program or creating a new one. to date delivered 40 proposals [approximately $350,000 in bids] and have secured all of them. I give credit to Proposal Pack for helping me deliver these in a timely manner." This Records Management Program Analysis Document is included in an editable format that can be customized for your own needs. Use this template to discuss the reason you are proposing a project or idea. For example, the purpose behind the Program Analysis Document is to provide the analysis and assessment of Company Name's Records Management Program for the life cycle management of content and documenting the processes of the business activities. Include a purpose statement that covers the problem and the central idea. This shows the reviewer that you have thoughtfully considered the specific issues. Restate the needs as determined by reading the RFP or reviewing your previous interview notes. For example, you might write something like " In order to provide staff better access to information and improve knowledge share, the Records Management Program must be able to provide the compliance, effectiveness, efficiency and continuity of all of Company Name's records. Include the major points of analysis and identify the opportunity. Restate the goals you identified previously (via RFP, interview, etc. For example, you might write something like " The Records Management Program is an important component for Company Name to continue to be a leader in the Technology Consulting industry. The Records Management Program will be able to satisfy Company Name's needs to be competitive in the consulting market and build a foundation for the records management controls and processes to govern the vast amount of information created and received and used in the conduct of Company Name's activities. Describe the AS-IS status of the records program and as necessary, describe the business problems being addressed by this project. List all sources of known content locations. This information will be needed to perform a Records Inventory. Use the Records Management survey and interview worksheets to gather this information. Content Source Description Location Owner. List all policies and procedures relating to records management. Title Latest Version Date Description Purpose of the Policy Source. Gaps in Records Management Policy and Procedure. Discuss the gaps in the as-is state that will need to be addressed to achieve future goals. The following outlines Company Name's organizational structure, including the purpose and details of each unit. Company Name's organizational structure is intended to demonstrate ownership and logical locations of content, and authority to govern the records program. Describe the components of the organizational structure. Examples include functional areas, such as business units and departments. For example, " The following outlines Company Name's organizational structure with the purpose and details of each unit. The purpose or function of each unit in the structure of Company Name will aid in the creation of the File Plan to categorize records, define ownership and locations of content, and aid in defining taxonomy. Sample Organizational Chart - replace with your own. Name and Acronym of Business Unit Function of Business Unit Description Specific Details about Business Unit Content Regulatory Requirements. The following outlines the regulatory or legal compliance requirements for managing the documents and records created in the daily activities of running the business. Most organizations are required to comply with local, state, and federal laws regarding the disposition and management of content created during the course of business activates. On this page, list rules or regulations that govern any part of the organization's lifecycle management of records. For example, recordkeeping practices under SOX, IRS, and HIPPA regulations are subject to audits and fines. The purpose of this section is to demonstrate that the organization adheres to regulations, has a plan for compliance, and to provide proof that the rules are understood. Briefly describe the requirement and state how it will be met. In order to provide accurate operating budget estimates and to ensure records are identified and managed in the context of how Company Name conducts business, record-centric workflow process must be documented and identified. Company Name could benefit from process improvement and workflow automation as a part of the Records Management Program to reduce handling time, minimize double entry, and increase productivity with efficient search and management processes. Use this template to discuss your priorities. Priorities are issues that are ranked by importance or urgency; thus, your number 1 priority is the issue you consider to be the most important and the one you should resolve first before tackling others on the list. Describe here why you are making a list of priorities. You may want to explain who created this list and describe its importance to your project. Stakeholders are vital to the Records Management Program for it to be successful and it is critical that they understand its importance to the organization and to their particular scope of influence. Senior Management must be involved and they will be providing the resources required, including time to research, design and implement the plan, along with any money required to buy necessary technology and expertise. Introduce the topic of stakeholders here and explain their importance to your proposal. In other words, do they need to be notified of every development, do they have a vote-how will they participate in your process? Also, explain how you developed the following list of stakeholders. Describe how this stakeholder is affected by your proposal, and give contact information if appropriate. For example: " Senior Management has the overall responsibility for the success of the organization and are the ones setting its strategic goals and objectives. Describe how this stakeholder is affected by your proposal, and give contact information if appropriate. Company Name plans to use the following technology during the course of this project. Describe in general the technology you plan to employ. Discuss why you will use this technology. This discussion might include facts about its efficiency, that it is state-of-the-art, easier to maintain, more secure, etc. You might want to cite industry articles or reference websites that offer more details. You might also want to include photos, lists of equipment, or charts below. Developing, implementing, and supporting an effective Records Management Program requires resources that completely understand the business and the types of documents created by the company. Describe all of the resources at your disposal that will be used on the project. Resources can be funding, labor, or equipment-related, and can be either internal or external to your company. A summary of the proposal follows, including identified needs, recommendations and goals to be achieved. Insert statement of how you are the best choice for achieving the goals outlined. The project summary outlines the project. It should be brief - no longer than two or three paragraphs. Use your needs, recommendations and goals to build this section. The Project Summary is a restatement of the Executive Summary and ties together once again the major points of the proposal and asks the prospect to take action. You can also add the Recommendations template to expand on your recommendations and action items in more detail. You should use the following structure: tell them what you are going to tell them (the Executive Summary), tell them the details (the various templates available to include as you see fit), then tell them what you told them and ask the client to take action (the Project Summary). The summary is most useful if developed after the rest of the proposal. It must encompass all the key summary points necessary to communicate the objectives of the project. 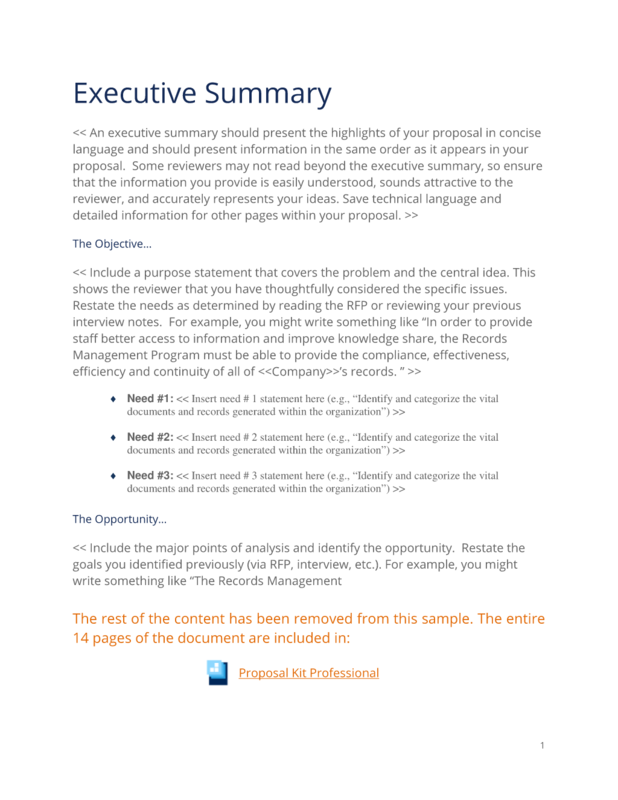 In many cases, the Executive Summary template is used to introduce the proposal, then detailed sections of the proposal follow using the various templates included in Proposal Pack. The Project Summary may be included to summarize once again at the end. The summaries will usually be the first part of the proposal package seen and often are the only part that is carefully reviewed before the decision is made to consider the project any further. The editable Records Management Program Analysis Document document - complete with the actual formatting and layout is available in the retail Proposal Kit Professional.